A month before we set off on our travels around Asia, I started to research luggage options, especially as I knew we needed backpacks. My husband Matt mentioned only taking hand-luggage, but just the thought of it made me shudder! I am the typical person that will over pack for a 2-week holiday, so how could I only take hand luggage for a long term journey? I soon came around to the idea after reading other blogs on how couples managed to travel with just Carry-On 40L backpacks. The Carry-On backpacks of choice were ‘Osprey Farpoint 40’ or the ‘Tortuga’ (both US companies) so we went into one of the camping shops to try them on. We only found the Osprey, but after a fitting we both decided this was the one for us. For ladies, it’s best to get the S/M size, rather than the M/L, as the straps fit and sit better on your back. For men, unless you are short, the M/L size seems to be the one. It’s so worth trying on the backpack before you buy it, as this will be travelling with you for a long time and it needs to be comfortable. Don’t just buy in the shop! Wait to find a good price online, once you know what you like and the right size for you! The straps fold up and can be hidden by a flap with a zipper that turns the backpack into a smart side bag with a strap and handle. It has it’s own Laptop sleeve compartment and it’s padded. The inside has plenty of space and pockets for leads and plugs. You can also find them on Amazon.com and the Osprey online shop – such as Osprey.com and Osprey Europe, but they cost £100+. So, even though these backpacks were great, I still didn’t have a clue how I was going to manage with only Carry-On luggage as someone that was used to a big suitcase for a 2-week holiday? Whilst I was researching, I came across many other blogs about Carry-On Packing, but the best blog & YouTube video that helped me was by this woman who calls herself ‘Travel Fashion Girl’. She goes around the world delivering seminars on how to pack ‘Capsule Wardrobes’ which consist of anything from 10-20 pieces of clothing, with the technique of mixing and matching items to make up a mini wardrobe. She recommends to have colours that go together with more than one item; so tops that will go with more than one pair of trousers and so on. Basically, if you have a top that only goes with one pair of trousers or shorts, don’t pack it! The real secret of fitting everything into the 40L is to use the ‘eBags Slim Packing Cubes – 3pc Set’ or similar brands – I bought mine from Amazon. Trust me, I have tried packing the same stuff without them and it’s just not the same space! We were planning on following the hot weather with mostly a mix of beach and city destinations, so no need for hiking or cold clothes. Yay! You are only allowed 7KG as hand luggage + a handbag, so it’s best to have light clothing, otherwise you should pack less garments! Most airlines are relaxed, but if you are unlucky it can cause a headache. You will also find that some of your existing clothes are just too hot (wrong material) or not quite right to wear in the countries you visit, so one thing to note is that you can buy clothes in any country, so don’t worry if you don’t have a lot to start with. Obviously, if you have some favourites and they fall into the above advice about mixing and matching, then take them! It’s not worth being too precious with clothes as there isn’t that much need to dress up when travelling. As long as you have a nice dress/ top and trousers that can be smart for a more special night out, the rest can be as casual as you like! I started with 15 items of clothing, 1 x Flip Flops and 1 x Converse, but whilst we were in India and Vietnam I acquired a few hippy trousers and tops that were more convenient for travel and being comfortable, so I ended up getting rid of a couple of things I didn’t wear & added to my load with a few new items. I always wear something comfortable for airports and flights, as you can get delays, as well as traffic jams to and from airports. Best advice is to wear something bulkier that you own, like a long skirt, dress, soft trousers and alike (but still comfy) so that your backpack is even lighter at airports. So remember, you can find clothing that is more appropriate for the countries you visit whilst you are travelling, stay cool with cottons and have a pashmina or sarong for the A/C! 2 x Sarongs (you can also pack these loose on top of the cubes) I always make sure I have a couple to mix and match with bikinis – have replaced these in every country we’ve been in as they are so cheap! One thing about Asia, is that you will need a Sarong to wear as a skirt if you want to enter any of the Temples. Keep one with you at any time, otherwise they rent them out. Jeans are just too hot for Asia, but these light trousers, similar to soft jeans, are great for a cooler night or cooler city. Sorry guys, a bit of advice for the ladies first and then I get back to you!! I’ve shared how Matt packed his Osprey too!! It’s just too hot, so don’t bother too much with underwired ones, get 1 comfy (non-wired) dark bra to wear with dark clothes and 1 skin colour or grey bra for light/white clothes! If you love your underwired bras, only bring 1 for those evenings out! Hopefully you will thank me for this advice – I still have my underwired bra, but just don’t wear it! Whilst in Vietnam, I bought the Sketchers Go Walk Flip Flops, which are so comfortable for walking, with support. It’s like walking on clouds. So I have Havaianas for the beach and these Sketchers for long walks! What else do I need? Update since writing this: Don’t bother with Sketchers! They are comfortable, but don’t last that long as the glue comes off with the heat! 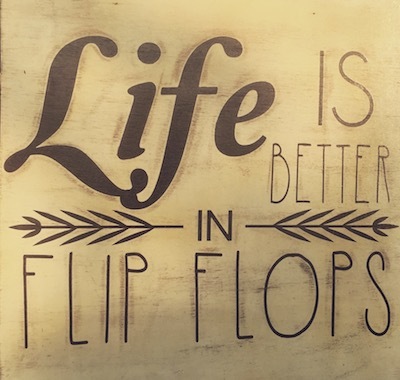 For those of you who like more stylish sandals, you can get some amazing footwear in other countries like India, Vietnam, Japan and Bali to name a few – It may be best to start off with less, as you may find something nice! The general rule is that you will always be wearing one of your footwear, so maybe keep it to 2 other pairs that fit into this backpack! There is no doubt that whilst travelling you will be tempted to buy clothes and lovely things that get waved in front of you. Remember, you only have hand luggage! The key is to replace something if you buy something else. You can also post stuff back home if need be! Post offices in Asia don’t charge as much as they do in the EU or US. All 3 Packing cubes are in! Put all your undies and bikinis into the zipped flap inside pocket! Here is a Video to demonstrate how I pack all my contents into the Osprey Backpack! Don’t forget a small Toiletry Bag! I carry a square shaped toiletry bag inside my handbag, as this keeps the backpack’s weight down. You really don’t need a lot! You should only carry 100ml for each item in your Carry-On luggage. However, in most Asian countries they are so much more relaxed about this rule. I once had shampoo and conditioner in a plastic bag, when travelling from Vietnam to Malaysia, and they let me take it through! Especially if you have sensitive skin like me. it is worth bringing your own rather than buying it abroad – If it runs out, you can order it online and get it delivered when you settle somewhere longer term. Don’t bother bringing shampoo, conditioner or body cream, as you can buy most things in any country! And don’t bring a towel as you don’t need it! – it will be provided or you can buy one in any other country. We see so many travellers with 70L backpacks and another spare bag. They always look like they struggle carrying this and most that we have spoken to have admitted to not using half the stuff they packed. Feminine products are more expensive in Asia, but unless you are going to pack a year’s worth, don’t bother bringing too much with you. Most places will sell it, especially if they are geared towards tourism, but be warned if you are going to very remote places such as less touristy areas in India, Cambodia, Indonesia and alike, you may not find anything but Pads. So just stock up before you set off from one country to another. So there is no need to bring a big bag, as you can buy most things around the world, including toiletries and some medicines like the ones mentioned above. I hope this changes the way you pack, as it makes the world of difference travelling with a smaller bag, not to mention having it with you on the plane. Just imagine not having to worry about losing your luggage! Useful ideas for those Sarongs!! I love Sarongs and try to use them as much as possible whilst travelling. There are so many things you can do with them apart from only wearing them on the beach, such as make one into a scarf, cardigan, dress, top or even beach bag! Here I am demonstrating how you can wear a Sarong as a cardigan, by tying the ends together – great to cover the shoulders if chilly one evening! I have provided a link at the end of this blog for some amazing ways to wear the lovely materials whilst you travel – enjoy! Told you I’d get there! This should be a lot easier for you – hopefully! Matt’s backpack is even lighter than mine. He travels with slightly wider Packing Cubes and only has 2! You shouldn’t need trainers unless you want to climb or walk really long distances. It’s up to you if you feel more comfortable having them – or buy some in any other country. Matt bought his in Vietnam! He also carries our Laptop, as has more space in his bag!! Oh, I nearly forgot!!! He also has a comfy Sarong from Sri Lanka. Most men in Sri Lanka and India wear Sarongs (they call the Sarongs ‘Lungis’) and they really like it when Westerners do too! Matt got a few thumbs up whilst in Sri Lanka and Kerala! Whilst in these countries it makes sense to try these things out. Apparently the most comfortable things ever! One word about MOSQUITO NETS! Most travellers tend to bring them, but in all honesty some hotels provide them in the countries where you need them. If they don’t, you can do what we do and use a mosquito spray for the room, a plug in and use oil or Deet on your body. You will need this wherever you are, especially in Asia. We find some local repellents are effective, but if you have a favourite then bring a 100ml bottle or 2 with you (but this will run out pretty quick) You can research if they have these in the countries you are thinking of going to or if you can get them delivered online. We use ‘OFF!’, which is a Deet aerosol spray and Citronella Oil, which is natural and seems to work well on me. I became sensitive to Deet and got a rash, so I now only use the Citronella Oil which is sold almost everywhere in Asia. In regards to Malaria, most places we have been to, and are going to, are low to no risk so we haven’t taken any anti-malarials yet (not keen due to the side effects) If the time comes where we have to, we can buy them in most countries in Asia at a fraction of the EU prices. They say to take them at least 1-2 weeks before you enter a country with risk, so you just need to plan ahead and check availability and prices. Here are a couple of great Videos I mentioned! If you found this post helpful, please share the love on social media with friends. If you like what you read, you can follow our blog to get emails with our latest posts as we publish them! Sign up on our side or footer menu. I’m always so impressed with people who can do the carry-on only thing. Shoes are my downfall every time! These are great tips for anyone trying to minimize their load! It is EASY to overpack, but hard to pack strategically! It was alien to me at first but this capsule wardrobe method of mixing outfits by colour works hehe! Luckily! wow what a great post! the combo of minimal packing and the right bag = ability to go with a carry on only! Will save you time and money in the end! Love the use of the sargong too!